It’s no secret that I was ready to adopt before Dave was. But that’s how things go around here: I like to jump right in, Dave likes to consider the options. We make a good team like that. Balance….or something. When I would get discouraged that we would never adopt, never have kids, etc. etc., Dave would always tell me to have hope. And I hated it. I wanted to wallow in my misery. It’s also no secret that I like to go JoAnn Fabrics. I need my yarn fix as much as anyone else. But there was 1 thing at JoAnn’s that drove me crazy. A snowflake ornament. 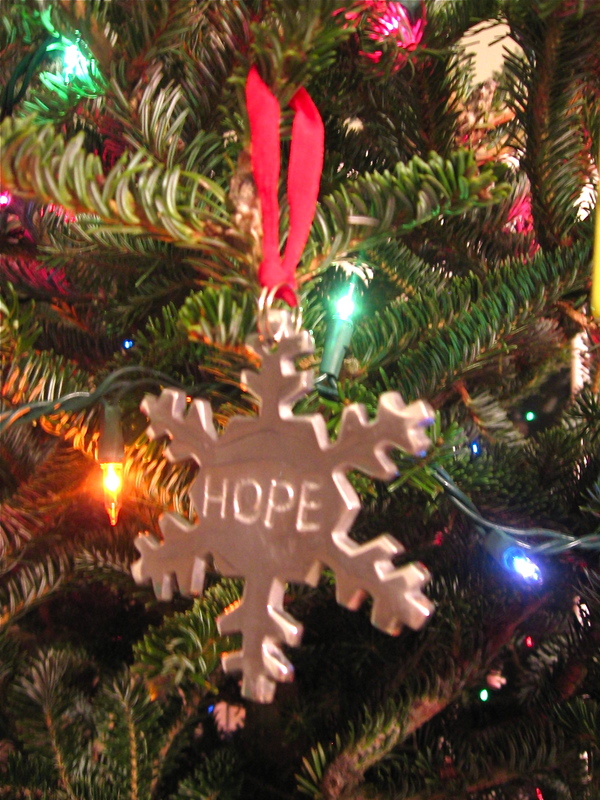 A snowflake ornament engraved with one word. Hope. Finally, during yet another trip to JoAnn’s, and yet another 5 minutes of my eye being drawn back to, you guessed it, the Hope ornament, I muttered “Fine. You win.” I bought the dumb ornament and hung it on the tree without even telling Dave. Guess what Dave told me the next day. I love my Hope ornament.